Panama City, Panama – Back in Panama City we decided to splurge and stay at a fancy boutique hotel for our last few days, but since we got back a day early we had to stay in a hostel for one night before moving into our sweet digs. We had six nights booked at the Casa Antigua hotel in Casco Viejo, which was super cool. We had a studio apartment with a kitchen and living room and a balcony and a rooftop terrace with a view of the street below and the downtown skyline. We were really torn between staying in our sweet room and checking out the city which we were also excited about. Thankfully, we had six days so we had time to see the city’s sights at a relaxing pace and get some downtime in our room as well. After our “Friends breakfast” each morning we’d hit the town. 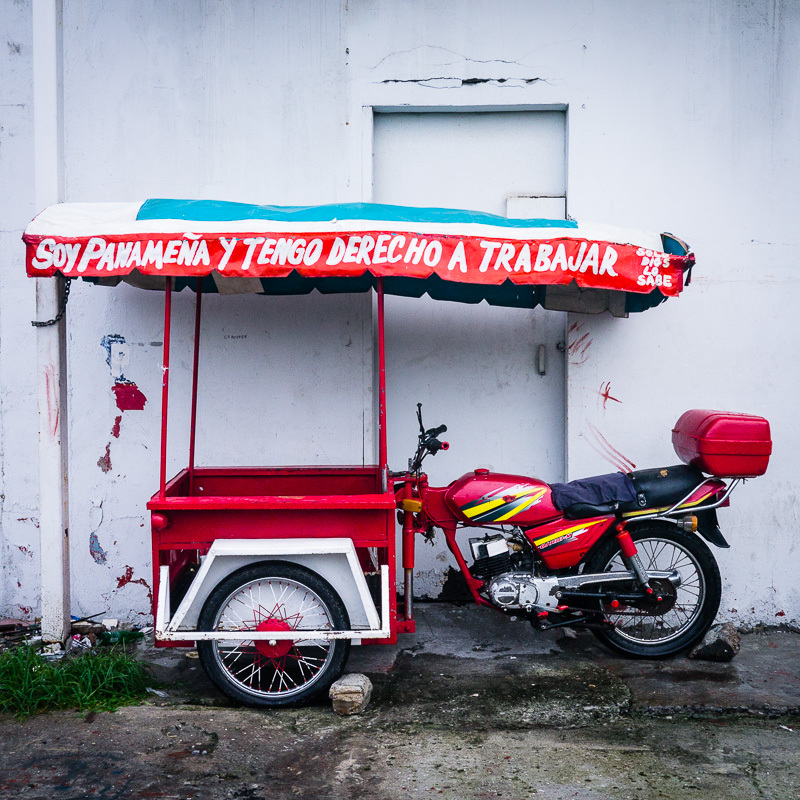 We took a taxi to the Causeway and rented bikes and cruised down the 2k road that connects four islands to the mainland and offers great views of the canal, ships, the Panama bridge and the city. We had lunch there at a decent Middle Eastern place on the water and visited an interesting, but rundown, Marine Museum. From our hotel we could walk down a waterside promenade from Casco Viejo to downtown. We walked down it one afternoon and enjoyed the cool sea breeze along with tons of Panamanian couples and families also out for a stroll. We ended up on Casa Uruguay in the downtown Bella Vista distinct. We had actually debated between staying in Bella Vista and Casco Viejo, and after seeing Casa Uruguay we realized we’d made the right choice. The area was sketchy and besides expensive clubs and restaurants there wasn’t much going on. We did have a really good dinner there and then got the heck out. Comments Off on What a Blas! Archipiélago de San Blas, Panama – We took another super crowded bus from Porotbelo to Colón – when we finally got seats in the back we discovered that the young couple behind us were making out. I guess this is the equivalent to “parking the car” for kids who don’t have cars. When we arrived in Colón they got off the bus and pretended not know each other. Slick, guys. We took the bus all the way to Colón instead of transferring at the grocery store because I thought we’d have a better chance getting a seat on the bus to Panama City, so we got to see a bit of Colón. We had been warned before by some ex-pats about Colón – that it was dangerous. It really is a pretty sketchy place, interesting though. It’s the center of Panama’s “free zone” where merchants can buy and sell goods tax free, but those markets aren’t open to the general public. What we saw from the bus window was more than enough of Colón. 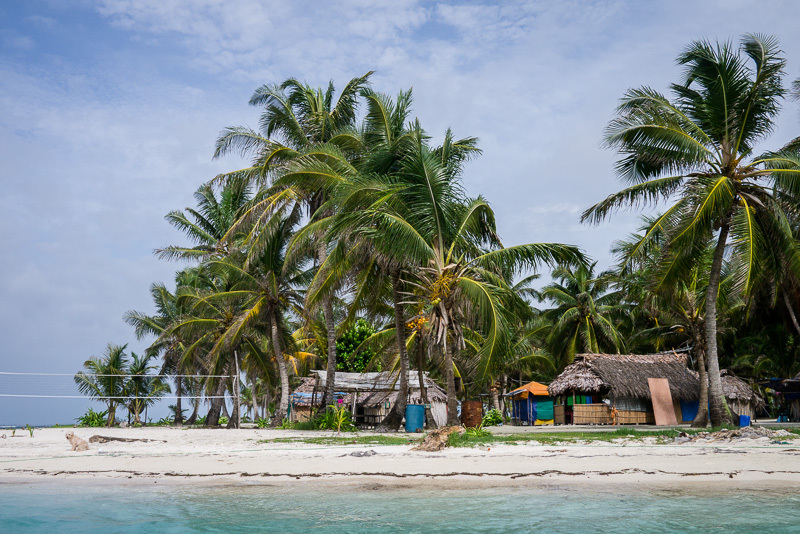 Our plan was to go to Panama City for one night and book a trip for the next day to the San Blas Islands in the semi-autonomous zone, Comarca de Kuna Yala. When we arrived in Panama City we took a taxi straight to Luna’s Castle hostel, which is THE place to book trips to San Blas. We sat around reading about the different islands and trying to figure out which one to go to. While we were there we ran into the Australian Stuart from our river trip in El Castillo. He was hanging out waiting to catch a sail boat from Panama to Columbia via the San Blas Islands. This is something that we originally wanted to do, but we’d discovered that there is no set schedule for these trips and that some boats are pretty sketchy – so you have to have the time to wait around for a decent boat to leave, which could take a week or more and we just couldn’t fit that amount of uncertainty in at the end of our trip. Pedasi and Portobelo, Panama – From Boquete we started our long journey to the Pacific Coast town of Pedasi. We had gotten directions on how to get there from a few people, all different, but they basically consisted of taking a lot of buses. We started early since we knew it would be a long day. The hotel’s owner dropped us off in town at the bus stop and got us on the bus to David. We then caught the bus to Santiago. From there we went to Chitré, Tables, and then finally Pedasi. One car ride and five bus rides later we were in Pedasi and our bus driver was kind enough to drop us off right in front of our hotel. When we woke up the next morning we saw something that we hadn’t seen in a long time: sun! Woo hoo! The hotel’s owner told us there was some flower art thing going on downtown so we went to check it out, but they were just starting their designs, and it was hot, so we decided to grab some snacks from the grocery store and take a taxi to the beach. Pedasi is very much a beach town, but the beaches are a ways from town, but thankfully, the taxi fare is cheap. 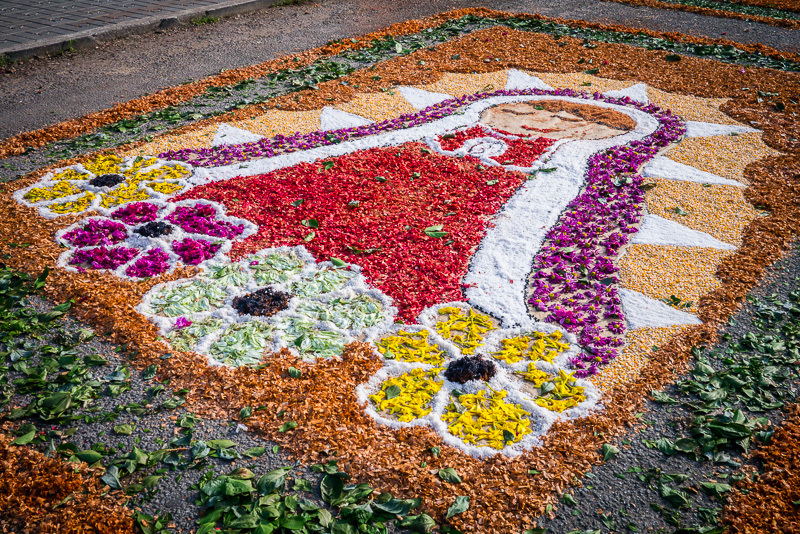 Artwork on the street using various plants and rice. We hadn’t been to the Pacific since Mexico and it was a nice change from the Caribbean. We had a really nice day at the beach. Stuart built us some shade using my sarong and some sticks and we lounged and swam for several hours. I played with a little girl for a while who I think was perplexed as to why I couldn’t really talk to her. She started acting stuff out once she realized I couldn’t understand Spanish. She was pretty funny. I thought we were having a good time until she decided to walk away without so much as a “adios”. Bocas and Boquete, Panama – Because we had cut Costa Rica short, we ended up having a full four weeks to spend in Panama. We were excited about Panama so we were pretty excited to have so much time there. Although, we soon learned that some of the places we wanted to visit were not going to be great to visit in the rainy season, so we had to cut a few places. It just forced us to move at a more leisurely pace, and at this point in our trip we weren’t complaining about that. After doing our research we decided to book our transportation from Puerto Viejo, Costa Rica to Bocas del Torro, Panama through a tour company. We could have done it on our own, but we heard that you only save a couple bucks and the inconvenience wasn’t worth it. Costa Rica – I was so not that into Costa Rica before we went. All that I really knew about it was that you could go zip lining and that it was super touristy, expensive and full of Americans. Stuart visited 10 years ago and really enjoyed it, but had heard it has changed a lot since. It was hard to pick out things we wanted to see because everything seemed so expensive and a lot of places would be hard to get to without renting a car. I know a lot of people rent cars in Costa Rica but they are fairly expensive and that just wasn’t the type of trip we were on. We were bus people, not car people. With all that in mind we only budgeted two weeks for Costa Rica. We spent nine days. In San Carlos we first had to visit the immigration office to get stamped out of Nicaragua. We then took a one and a half hour boat ride down the river to Los Chiles in Costa Rica. Even though Costa Rica is across the river from San Carlos we had to take the boat to a town with an immigration office. We were advised to get there early, and this time it paid off because the seats on the first boat filled up quickly. 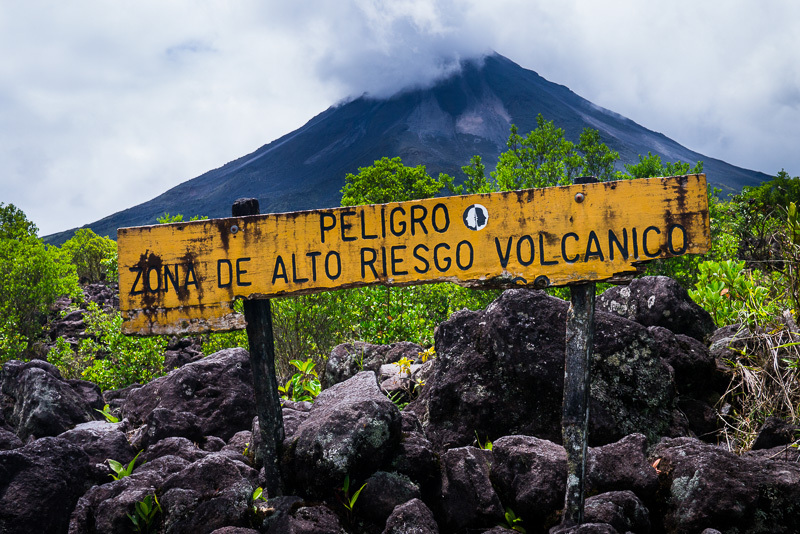 Viewing area for Volcán Arenal along the trail. When we arrived in Los Chiles we got in a long line with our luggage for customs, but soon the staff pulled out all the Gringos from the line and let us go straight to the immigration office which was a couple blocks away. Maybe they assume white people don’t smuggle stuff. I guess they don’t get the TV show “Locked Up Abroad” down there. There were a lot of Americans doing “visa runs” on our boat and they were pretty helpful in giving us directions to the bus stop and helping us figure out where to change money – which turned out to be just some lady’s house. She had a really weird way of doing the math and that made me nervous, but her exchange rate turned out to be really good.